I’ll be honest: I’ve got egg rolls on my mind. After editing Monday’s feature story on Asian egg rolls (cha gio, lumpia, spring rolls, and the like), my brain was off to the races, attempting to justify a reason to deep fry a batch. My Cantonese parents fried egg rolls—or what we know as spring rolls—all my life. Theirs is a traditional dim sum rendering of the dish, with pork, mushrooms, and bean sprouts, minced into a paste, wrapped and fried to golden crispiness. While I love that recipe (and I’ll share it with Takeout readers very soon), I’ve reached the age where I also think egg roll shouldn’t just be a noun, but a verb. Only in the past few years have I tried a Philly Cheesesteak and a reuben egg roll. As a Chinese immigrant, my first instinct to see the words “egg roll” appropriated and bastardized like that was infuriating, but the fact was both were ridiculously delicious. 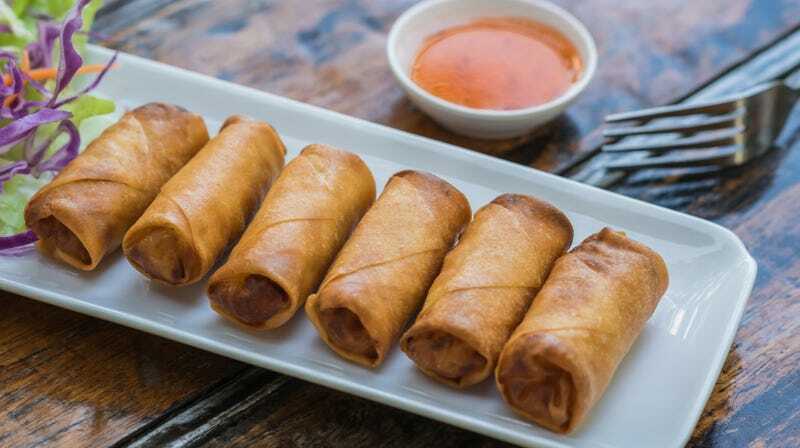 Framed as a hand-held, deep-fried cylindrical vehicle, and suddenly I don’t feel so culturally protective with egg rolls—I see a world of possibility. So brace yourselves, Takeout readers: I am on an egg roll tear these next few weeks. The brakes have been disengaged. I rely on you, loyal commenteriat, to tell me what I should egg roll next. Is it beef bourguignon? Lobster roll? Banh mi? Chicken pot pie? A California roll? How about a peach cobbler? No suggestion is a bad suggestion. I will attempt as many egg rolls as the good Lord will allow, and publish my findings on this very site.